His Eminence Kalu Rinpoche was one of the great wisdom masters of our age. He was born in 1905 in the district of Tresho Gangchi Rawa in the Hor region of far eastern Tibet. His father was Legshey Drayang, the thirteenth tulku of Ratak Palzang. His mother, Drolkar, was a disciple of Jamgon Khyentse Wangpo, Jamgon Kontrul Lodro Thaye, and the renowned Lama Mipham Namgyal. Both his father and mother were devoted to religion, and shortly after their marriage they spent time in retreat together. It was during that retreat that Drolkar became pregnant. Kalu Rinpoche's father, not yet knowing that his wife was pregnant, had a startling vivid dream of his teacher Kontrul Rinpoche. In this dream or vision, Kontrul announced that he was coming to stay with them and that they should prepare a place for him. The meaning of this dream appeared to make itself clear some time later, when His Holiness the Gyalwa Karmapa recognized the child as the activity incarnation of the great Kontrul Rinpoche. The young child showed remarkable compassion to all beings and his intellect proved to be exceptional. He began his monastic career by his own wish at the age of thirteen, entering the glorious Palpung Monastery of His Eminence Tai Situ Rinpoche. At that time Tai Situ Pema Wangcho Gyalpo gave him his getsul ordination, naming him Karma Rangjung Kunchyap. The prefix "Karma" identified him as a practitioner of the Karma Ka'gyu tradition. 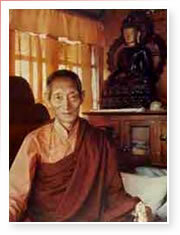 At sixteen, Kalu Rinpoche entered Kunzang Dechen Osal Ling, the retreat center originally founded by Jamgon Kontrul Lodro Thaye. It was at Kunzang Dechen that he completed the traditional three year retreat under the direction of venerable Lama Norbu Thondup. During that retreat Kalu Rinpoche received the complete transmission of the Karma Ka'gyu and Shangpa Ka'gyu lineages, in particular the transmission of the Five Golden Dharmas of the great Siddha Khungpo Naljor. At the age of twenty-five his heartfelt desire was to practice meditation in a wilderness retreat in the mountains. Leaving everything behind, Rinpoche departed to do an extended solitary retreat in the desolate wilderness, forests and mountains of eastern Tibet, living the ascetic life of a wandering yogin. For twelve years he lived in that manner, imitating the eremetical life of Milarepa, Tibet's great yogi. Occupying lonely caves, he spent his time in spiritual practice and meditation. 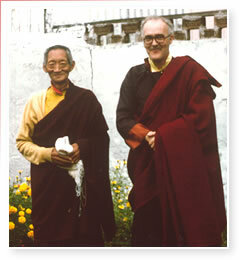 In the 1940s Kalu Rinpoche began visiting monasteries, traditional centers of learning and practice, all over Tibet. He was now a recognized wisdom master, called from his retreat by Tai Situ Rinpoche and blessed by the supreme custodian of the Ka'gyu lineage, His Holiness the Karmapa. An accomplished master of the Five Golden Dharmas of the Shangpa school, he bestowed ripening empowerments and instruction on a vast number of yogis and yoginis. On a visit to Lhasa, around 1948, he was asked to grant teachings on the Regent of the young Dalai Lama. In 1973, at the request of His Holiness the 16th Karmapa, Kalu Rinpoche bestowed the full Ka'gyu transmission on the four regents Shamar Rinpoche, Tai Situ Rinpoche, Jamgon Kontrul Rinpoche, Gyaltsap Rinpoche, and also, at the same time, on the exceptional Canadian Lama Namgyal Rinpoche. These teachings included all the Ka'gyu major empowerments, instruction in Mahamudra and the six doctrines of Naropa, along with full inner explanation.